The price of a World Series title? 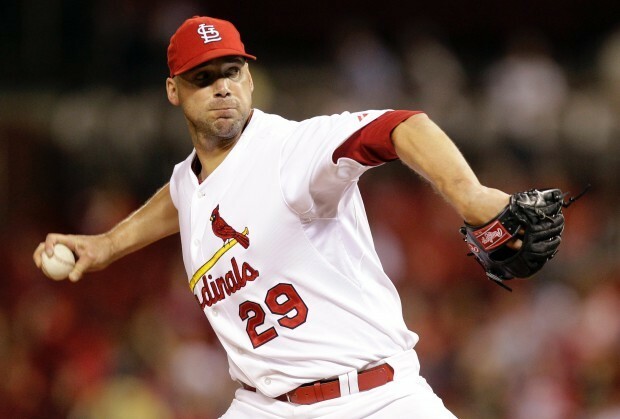 For Cardinals, it may be Chris Carpenter. There’s always a price to pay in life. Success doesn’t come without failure and often times, elation doesn’t come without desolation. For the St. Louis Cardinals, the price of their miraculous 2011 championship wasn’t losing Albert Pujols (like many had thought), but perhaps ace Chris Carpenter. You could certainly make a case for Pujols or World Series hero David Freese being the most valuable player on last year’s Cardinals team. But in my eyes, it was hands down Chris Carpenter. Nobody threw as many innings in the big leagues last year than Carpenter, who was marvelous in the postseason. He won five of the six games he pitched, with his only loss coming in a 4-2 defeat at the hands of the Rangers in the World Series. In that game he pitched seven innings of two-run ball while striking out four and allowing just two earned runs. He wound up pitching just four days later and beat the Rangers for the second time in the Series, limiting Texas to two runs on six hits over six innings while helping St. Louis win its 11th championship. Now, with just two weeks before the start of the 2012 MLB season, Carpenter is dealing with a nerve issue in his right shoulder. The initial diagnosis was that he had a bulging cervical disc in his back and there was actually some positive news on his condition earlier this week. But it has been discovered that the discomfort he has experienced in his shoulder is actually nerve damage and nobody knows how long it’ll take for him to recover – or if he even will. The word “retirement” and Chris Carpenter don’t really go together. He’ll be 37 years old at the end of April but it would take an army to pull him off the mound. But it really isn’t up to him on how his body will react over these next couple of days, weeks, and months. He rejected surgery on Wednesday because quite frankly, it wouldn’t help. It’s not like he has a tear – he’s dealing with nerve damage. All he can do now is wait for the nerve to heal itself (which could take some time), test his arm out, and then go from there. The nerve could essentially heal itself next month but then become damaged again when he attempts to throw. It’s just hard to predict what will happen next. For the Cardinals’ sake, hopefully the nerve does regenerate quickly and he can get back on the mound at some point this season. But the news out of St. Louis right now isn’t good and there’s a chance that 2011 was the last we’ll see of Chris Carpenter in a baseball uniform. And if that is indeed the case, at least he and Cardinal fans will remember him for being the warrior he was in the 2011 postseason. The Giants paid their World Series debt in the form of losing Buster Posey, Freddy Sanchez, Pablo Sandoval and Brian Wilson for extended periods of time last season, which prevented them from qualifying for the postseason. Now the Cardinals are paying the price for theirs and it’s a shame that it has to come in the form of Carpenter. Will the American League return to dominance in 2012?